The text in this article is written in 1st person by 4J25, that will likely change later. 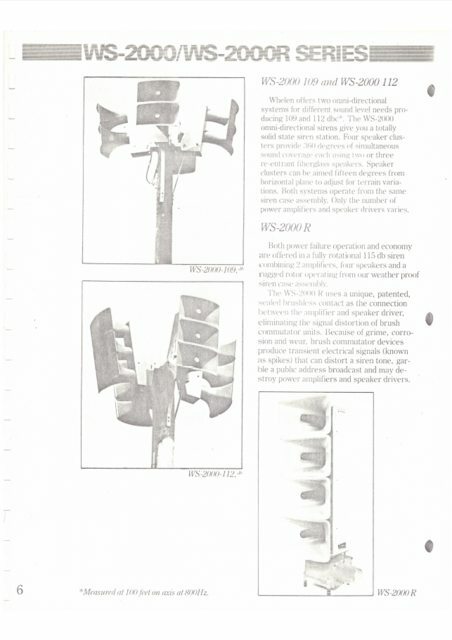 A brief history of Whelen outdoor warning sirens. Important: Text that is bolded refers to information that has been inferred. Essentially, this is information for which I have been unable to find concrete evidence, but related topics and other information strongly suggests that it should be correct, or if it's almost painfully obvious. From 1977 to 1987, the controller on each Whelen siren consisted of a separate tone generator and decoder. Any siren using this form of controller contains the prefix "WS" in the model nomenclature. In 1987, the microprocessor based ESC-864 was introduced. Any siren with this controller or newer or any older siren that has received a front panel upgrade contains the prefix "WPS" in the model nomenclature. Contrary to popular belief, "WS" and "WPS" don't actually stand for anything. In 1993, the ESC-864 was upgraded from analog to digital. In 2001, the ESC-864 was replaced with the ESC-2020. Around 2011 or 2012, the ESC-2020 was replaced with the ESC-2030, which is in production at the time of this post. You will see the name Bruce Howze mentioned a bit. 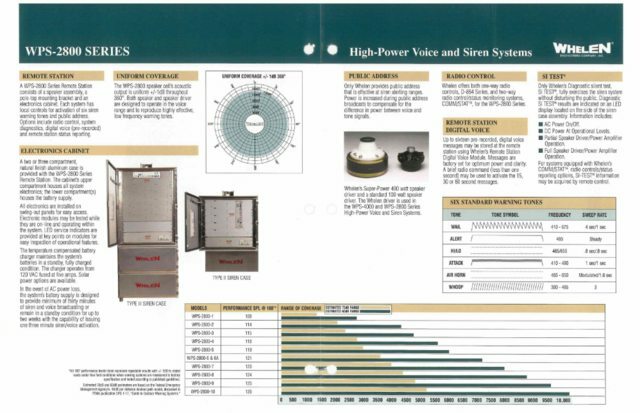 Mr. Howze, along with his company Community Pro Loudspeakers, designed a multitude of Whelen sirens and parts. Howze and CPL are an integral part of Whelen's history, and they still supply their 400-watt "superpower" drivers. I have opted to include the Vortex under the 4000 series section, similar to how the Vortex-O would be considered part of the 2000 series. With that said, let's talk sirens! 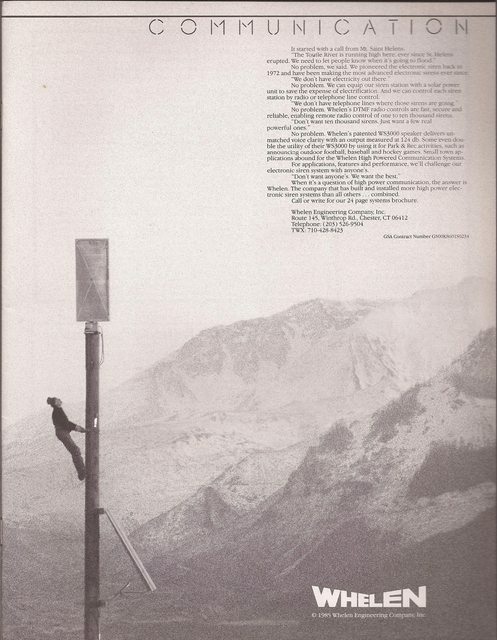 Whelen Engineering first entered the outdoor warning siren market in 1977, with their WS-1000 siren. While capable of three distinct signals (wail, yelp, and two-tone) and voice functionality, the primary feature introduced by the 1000 was its battery backup—the first of its kind on the market. The siren head itself was of a rather simple design: four* to eight 125-watt drivers, each routed through Atlas CJ46 re-entrant fiberglass paging horns, all attached to a utility pole. 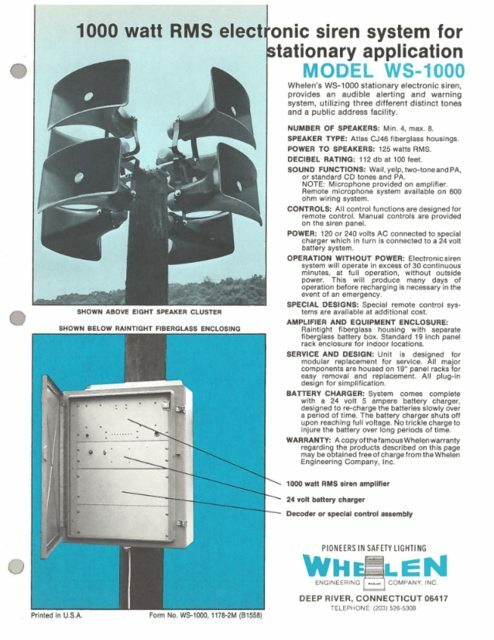 Despite being Whelen’s revolutionary introduction to the outdoor warning siren market, the 1000 never seemed to be too popular, and it ended up having a relatively short production run, ending in 1979. This advertisement from 1978 depicts an 8-speaker WS-1000. A few WS-1000 sirens have been found with less than 4 speakers, however it appears that the minimum was intended to be 4. Luckily, Whelen had a siren lined up to replace it. The WS-2000 series was introduced in late 1979. It took the simplicity of the 1000 and installed it in a more streamlined and efficient package. The 2000 series sirens used the same CJ46 re-entrant horns, however, this time they were arranged vertically along an aluminum “column” and used 100-watt drivers. Each column was on a pivot and could be tilted downwards. Initially, eight, twelve, and sixteen-speaker models were available, being the WS-2000-109, WS-2000-112, and WS-2000-115 respectively. 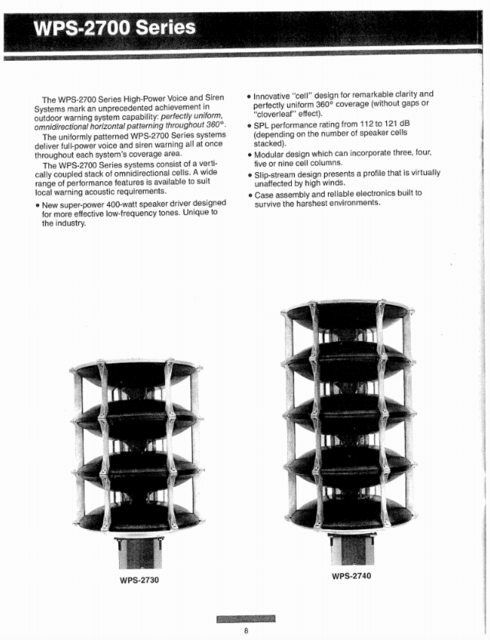 Over the next few years, two additional sirens would be introduced to the 2000 series line: the WS-2000R and the prototypical WS-2500, Whelen’s first “true” 360-degree omnidirectional siren. The original 2500 design, drawn up by Bruce Howze in 1981, would never see actual production, and it was absorbed into the 2000 series line as a twenty-speaker siren. 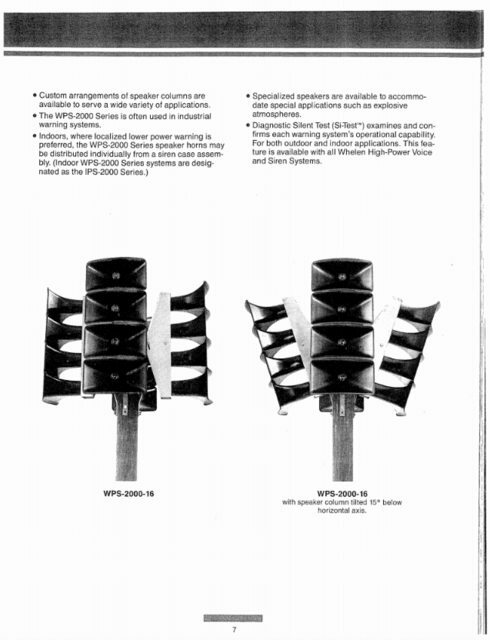 The 2000R was a four-speaker rotational/directional siren. It consisted of four CJ46 horns attached to a rectangular aluminum body that sat atop a rotor. Unlike the 3000 series sirens introduced around the same time, the 2000R utilized a sealed brushless contact to connect the siren head with the controller. This allowed the siren to rotate a full 360 degrees. Some 2000Rs, most notably those in St. Louis, Missouri, also included a mesh screen inside the horns. The 2000R was a very short run, and it was not a very popular siren. Early 80s brochure pages showcasing the early 2000 series, including the 2000R and then-prototypical 2500. 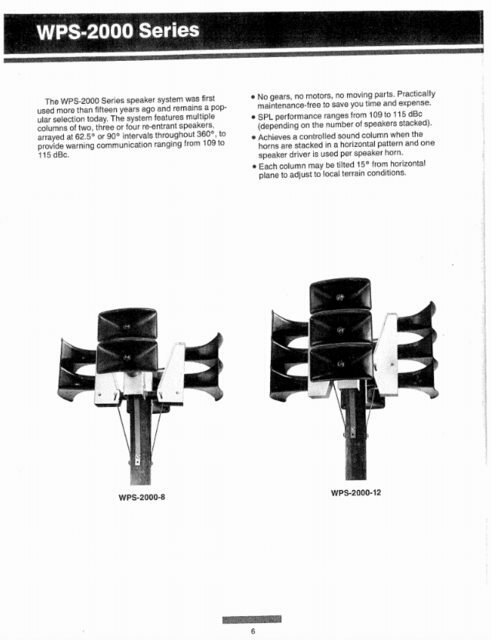 Not long after the introduction of these two sirens, likely around the debut of the 3000, the model nomenclature was changed to reflect the number of speakers instead of siren output. This resulted in the WS-2000-8, 2000-12, 2000-16, and 2000-20, with the 2000-20 being the aforementioned twenty-speaker 2500. Not much changed until 1987, when the series received the “WPS” prefix. 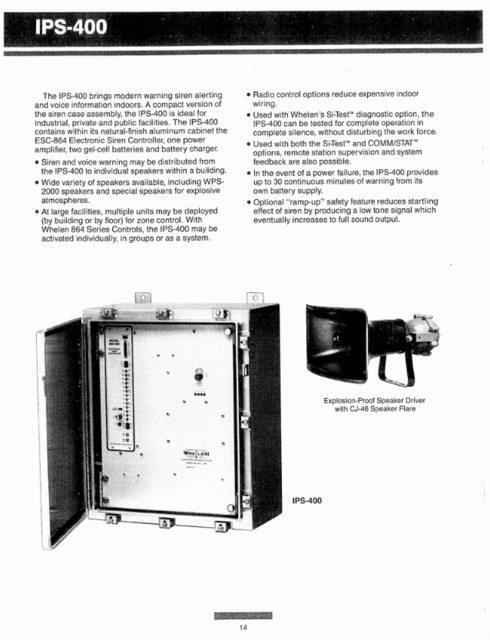 The IPS-2000 series was introduced as an indoor version of the WPS-2000. 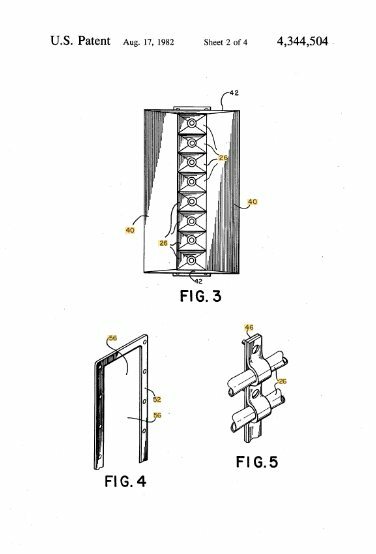 Multiple variations of siren speakers, including the 2000 series speakers as well as an explosion-proof variant, would be placed around a building and it would all route into a central IPS-400 control cabinet. This allowed for zone, group, and individual control of each speaker. Also notable, a “ramp-up” safety feature was available wherein the siren wind up would start at a lower output and increase to full, as to not startle the occupants in the building. 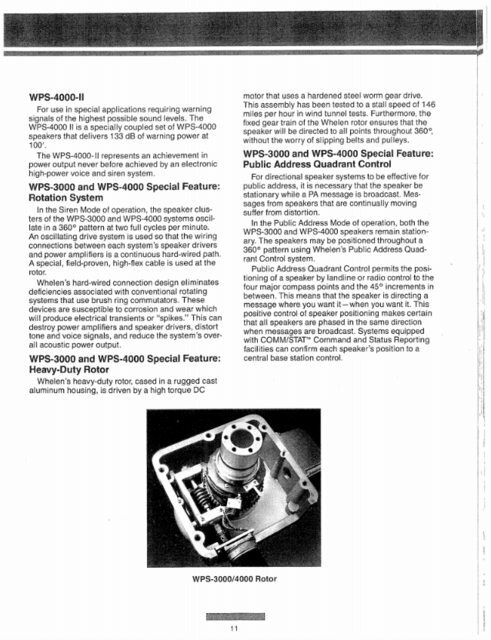 More importantly, the WPS-2700 series was introduced the same year. Designed by Bruce Howze, the 2700 series utilized individual fiberglass “speaker cells”, wherein sound would be reflected onto two curved surfaces and thrown horizontally in a true 360-degree pattern. Each cell was held together by aluminum brackets. The 2700 series also introduced Whelen’s 400-watt “superpower” drivers, again designed by Bruce Howze along with his company Community Pro Loudspeakers. 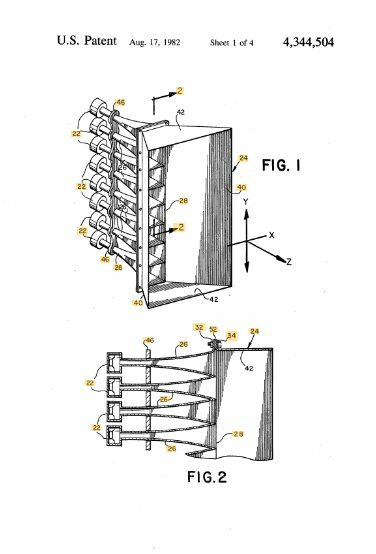 The 2700 was offered in three, four, five, and nine speaker cell arrangements being the 2730, 2740, 2750, and 2790 respectively. Each output area would include a mesh screen, as to prevent dirt and wildlife from decreasing sound output. Also available was the WPS-2740 Series Mobile Command Post, which consisted of a WPS-2740 mounted atop a hydraulic platform atop a trailer. 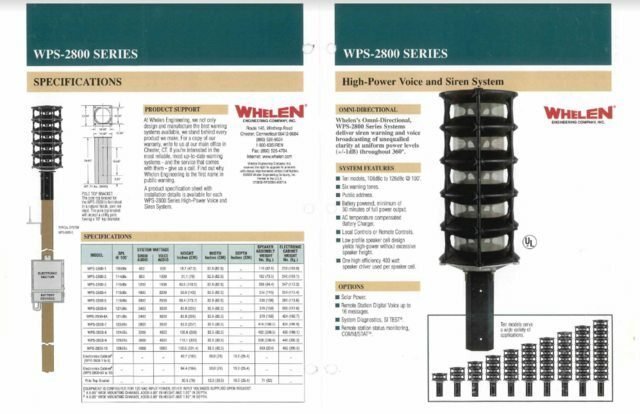 Several pages of a 1988 Whelen Systems brochure, showcasing the WPS-2000, WPS-2700, and WPS-3000 series sirens. Note that there is no mention of a single row 2000 model. 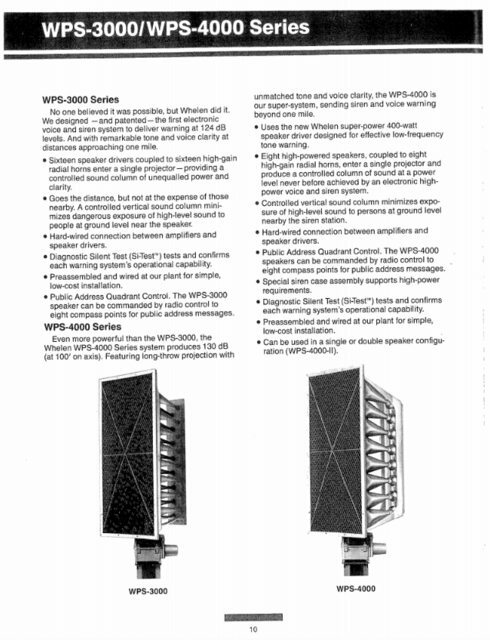 A few more pages from the same brochure, showcasing the WPS-2700 series and IPS-400 indoor system. The WPS-2700 series ultimately superseded the WPS-2000 series in both design and popularity, and the WPS-2000 series went out of production in 1990. (Something that should be noted: a WS and/or WPS-2000-4 was offered at some point, but there is little to no mention in any documentation.) However, the 2700 series would soon follow. In 1991, the 2700 series was retired and replaced with the improved 2800 series. Not only did it introduce a full fiberglass housing, but it expanded on the modular principle of the 2700, adding six new variants. Not to mention, the mesh screen was enlarged to cover a wider radius around the siren output. 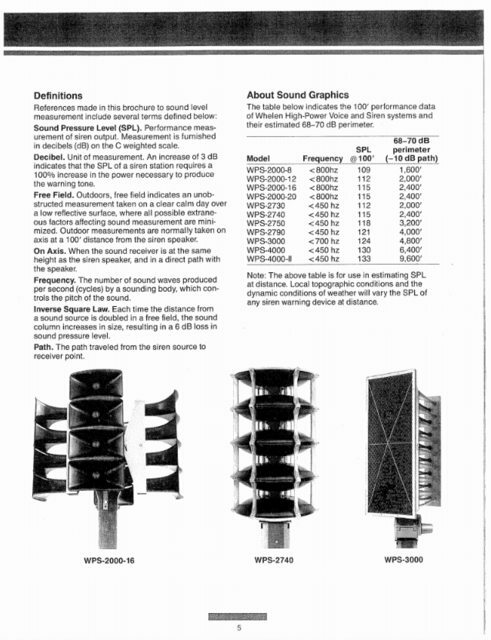 The 2800 series was available in a one to ten speaker cell arrangement, as the WPS-2800-1, 2800-2, 2800-3, 2800-4, 2800-5, 2800-6, 2800-7, 2800-8, 2800-9, and 2800-10. The 2800 saw wide use across the United States and abroad during its long production run of 15 years. 2000 brochure showcasing the 2800 series. The 2800 also saw two “sub-models” that branched off from its line. Introduced in 1998 and catered towards fire departments, the WS-280 series offered two-tone radio as well as local activation, while sacrificing the two-way capabilities of the 2800. The 280 series were available in a one to five speaker cell arrangement, otherwise known as the WS-281, WS-282, WS-283, WS-284, and WS-285. The WS-280 series was retired in 2002. 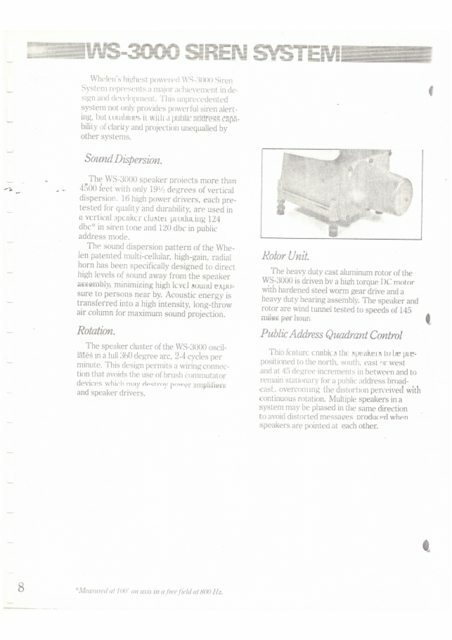 WS-280 series, as seen on Whelen's site back in 1998. In 2004, the Vortex-O series was introduced. Similar to the 280 series, the Vortex-O offered many of the same features as the 2800 series, while sacrificing others in order to create a more affordable siren. The Vortex-O was not capable of relaying voice messages—pre-recorded or live—however, it retained two-way capabilities, unlike the 280. The Vortex-O series were available in a one to four speaker cell arrangement, as the VortexO1, VortexO2, VortexO3, and VortexO4. The reasoning behind the “Vortex” designation was due to its functionality being similar to that of the rotational Vortex series, albeit in an omnidirectional package. In 2006, the Vortex-O series was renamed the Omnialert series, with nomenclature changing to OAO1, OAO2, OAO3, and OAO4 respectively. The Vortex-O series, as seen on Whelen's site in 2004. However, later that year, the 2800 series was replaced with the 2900 series. The 2900 series design is almost identical to the 2800 series. With a similar model designation, the 2900 series is arranged as follows: WPS-2901, 2902, 2903, 2904, 2905, 2906, 2907, 2908, 2909, and 2910. Additionally, the Omnialert nomenclature dropped the second “O”, becoming OA1, OA2, OA3, and OA4. The 2900 introduced the option for a stainless-steel cabinet in addition to the standard aluminum cabinet. While the technical nomenclature for this feature would include either an “A” or “S” at the end of the “2900” designation, it is often referred to in documentation without this suffix. The mesh screen radius was also decreased down to a size similar to its ancestor 2700 series. Perhaps the most notable feature introduced by the 2900 was the “EZ-Pull” driver system, wherein the 400-watt drivers are attached to handles and can be easily pulled out of the siren for maintenance or replacement. This is in stark contrast to the 2700 and 2800 series sirens, where partial disassembly of the siren itself was required to access the drivers. 2011 saw the introduction of the Firehouse series sirens. Essentially a spiritual successor to the WS-280 series, the Firehouse series is aimed at the fire department market. Available in a one to four speaker cell configuration, the Firehouse series is designated as FHS1, FHS2, FHS3, and FHS4. The 2900 series, including the Omnialert and Firehouse series, is currently manufactured. Whelen's current omni-directional siren lineup. Let’s jump back to 1981. 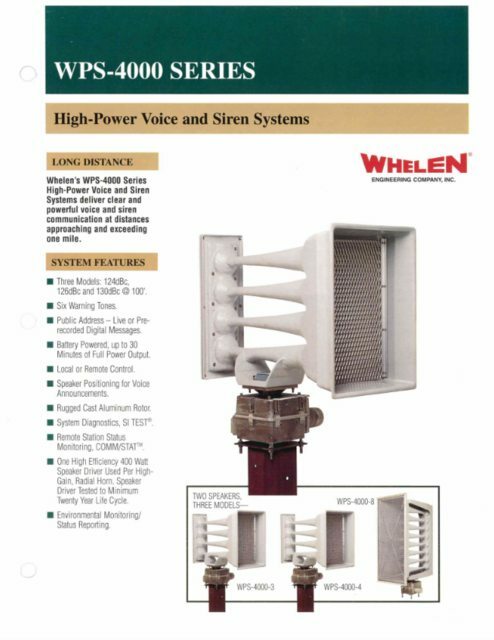 Whelen has quite the formidable lineup, what with the WS-2000 series, yet they have nothing to compete with the high-output mechanical sirens on the market. They reach out to Bruce Howze at Community Pro Loudspeakers, with the request to design a siren that could perform at or above the level of the Federal Thunderbolt. With this, the WS-3000 is born. This siren is most commonly known as the “3016” or even “3000-16”, but nothing has been found to support this claim after consulting with documents and Whelen personnel. The WS-3000 consisted of a directional projector with mesh screen and sixteen horn “throats” traveling back to sixteen individual 100-watt drivers arranged in a staggered vertical fashion. Mounted atop a cast aluminum rotor, the WS-3000 would oscillate in a full 360-degree arc, avoiding the need for brushes or collector rings. Boasting a 124dB rating—never before seen with electronic warning siren—it quickly became a popular siren. The WS-3000 was also capable of quadrant control, wherein the siren head could be positioned in each cardinal and intermediate direction. This action could be synchronized across multi-siren systems, eliminating distortion of voice messages. In 1987, the 3000 series received the “WPS” prefix. 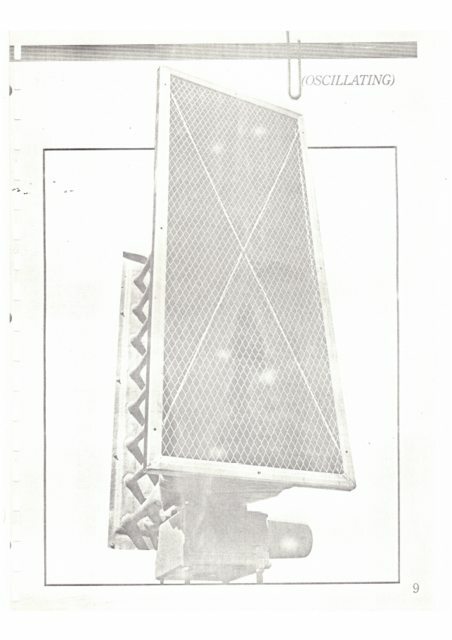 It was around this time that an additional, horizontal support brace was added onto the mesh screen. In 1991, the 3000 series was retired. The 3000 series was a key component to Whelen’s advancement in the industry, and its proven design can be reflected in the 4000 series. It's no wonder this siren was and is so popular with communities and enthusiasts alike. Early 80s brochure showcasing the 3000 series. 1988 Whelen Systems brochure showcasing the 3000 alongside it's mighty brother, the 4000. In 1988, the first siren in the 4000 series was introduced. 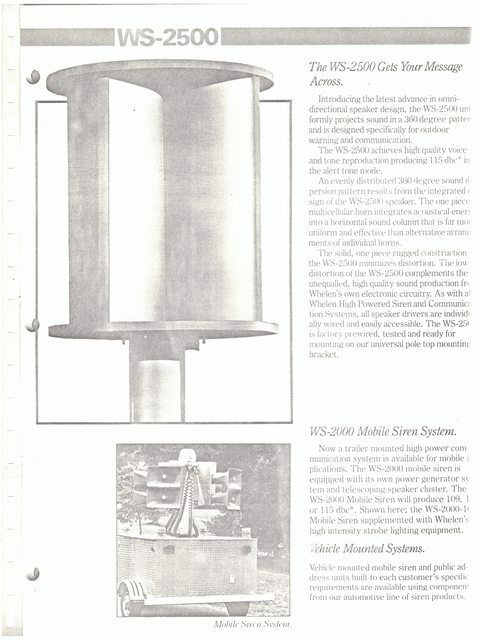 The WPS-4000 was a rotational siren similar in design to the WPS-3000, however, it utilized eight of the 400-watt “superpower” drivers with eight throats instead of the 3000 series’ sixteen 100-watt drivers with sixteen throats. With 3200-watts being concentrated in one direction, the WPS-4000 was able to muster an impressive 130dB rating. 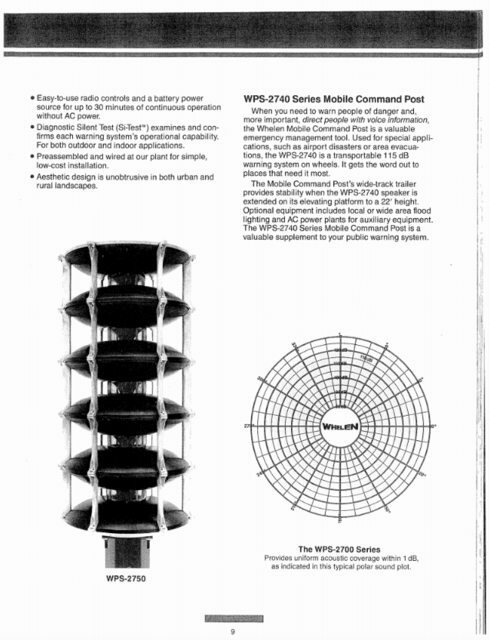 Also available was the WPS-4000-II, which consisted of two WPS-4000 siren heads mounted on a singular rotor. Only one of these was produced. 1988 Whelen Systems brochure showcasing the 3000 and 4000. On the second page you can find a description of the 4000-II. In 1990, the 4000 series received an overhaul. The 3200-watt 4000 was renamed the WPS-4000-8, and two additional sirens were introduced: the WPS-4000-3 and 4000-4. These two sirens resembled half of a 4000-8 and contained three 400-watt and four 400-watt drivers respectively. Otherwise, they retained all the same features. Around the same time, the WS-404R was introduced. Featuring the same design as the 4000-3 and 4000-4, it sacrificed voice capability and was sold as an affordable, tone-only siren. Initially, the 4000-3, 4000-4, and 404R included a mesh screen at the very end of the projector just like the 3000 and 4000-8, however around 1995 their design was changed to incorporate the screen further back in the horn, among other cosmetic changes. Along with this change, the WS-404R became the Vortex series, with a three-driver version made available. These would be known as the Vortex3 and Vortex4. 1996 brochure showcasing the 4000 series lineup. Around the turn of the millennium, in either 1999 or 2000, the 4000-3, 4000-4, and 4000-8 became the 4003, 4004, and 4008 respectively. In 2002 the Vortex series was changed to the Vortex-R series, and an additional two-driver model was added. These are known as the VortexR2, VortexR3, and VortexR4. In 2003, the WPS-4008 was retired. Around 2010, the single-driver Vortex R1 was introduced. The 4003, 4004, VortexR1, VortexR2, VortexR3, and VortexR4 are all currently manufactured. Whelen's current rotational siren lineup, including the Hornet. Locations known to have/have had 4000 series sirens: Columbus, OH (4004s) Baton Rouge (4008s) Plano, TX (4008s) McKinney, TX (4008s, 4004s) A few nuclear power plants: Duane Arnold, Seabrook, etc. The Hornet is an interesting siren first introduced by Whelen in 1996. Advertised as a medium range, economical siren, it consists of a fiberglass “bowl” shaped re-entrant projector and a single 400-watt driver, all located atop an oscillating rotor. The Hornet is a tone-only siren. Also made available is the WS400H, which is essentially a singular Hornet siren speaker meant for outdoor personnel notification. The Hornet is currently manufactured. The Hornet, as seen currently on Whelen's site. And that about wraps things up! I hope you enjoyed reading through all of this. Oh, one more thing. Here are all the brochures and documents so you can take a look for yourself! This page was last edited on 11 April 2019, at 17:56.